Hi and welcome to Merry Monday - where we get to make Christmas cards all year round! 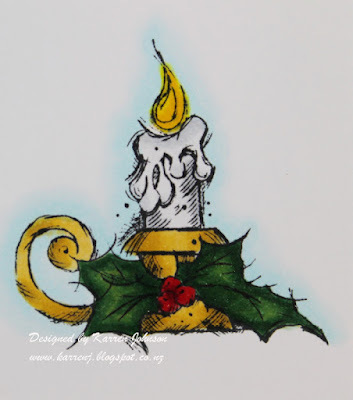 This week, Sue has challenged us to use candles and flowers on our Christmas card. I stamped the candle onto some X-press It cardstock and colored it very quickly with Copics. I went over the whole image in Wink of Stella so it has a lovely shimmer IRL. I outlined the image in B0000 and B000 pens and then decided to use that as my accent color. So I cut a strip of Audrey Blue cardstock for the left hand side. The sentiment comes from a Verve set called Christmas Joy. Thanks for visiting. The rest of the DT have some wonderful inspiration so be sure to check them out. Is this not one fabulous sketch? 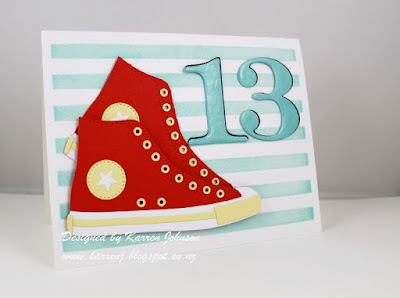 For my card, I used some new goodies that just arrived this week - new colors from Simon Says Stamp and a new set designed by WP9. I started by cutting a stitched circle and white-embossing my sentiment. 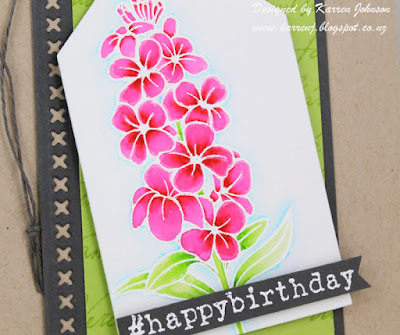 I then placed it on the card base and drew a light pencil line around the circle so I knew where to stamp my flowers. I only used the outline image from this builder set and stamped them in some of the new SSS colors - Duckling, Melon, Sunkist and Hollyhock. 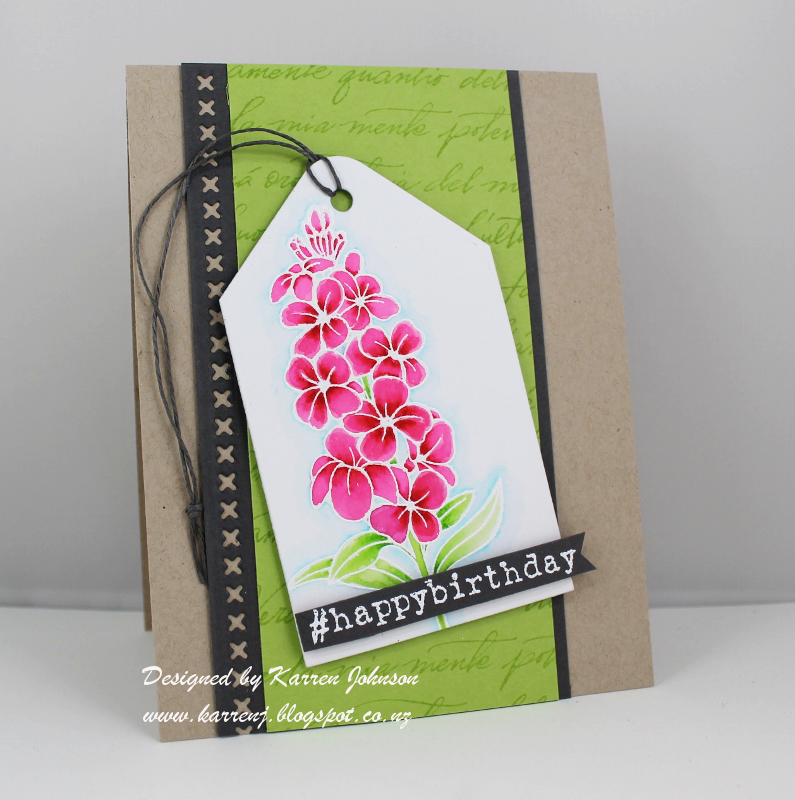 I then stamped a few dots in Jellybean to tie the flowers together. The banners were sponged in Jellybean and Melon inks before being die-cut. Some silver thread was dropped behind the circle and some enamel dots added before calling my card done. 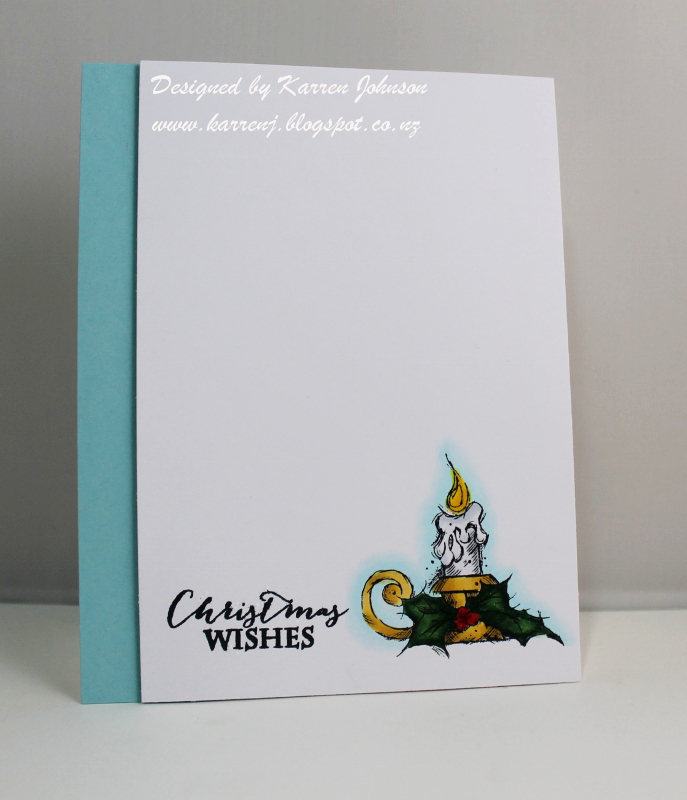 The design team have created some wonderful cards with this sketch so I hope you'll check them out and give this sketch a go. Thanks for visiting and thanks again to the team of wonderful ladies at The Paper Players for inviting me to join you for the last six months. I'm also entering this into the Simon Says Stamp Wednesday challenge of Anything Goes. Hi there! If you're looking for my Color Throwdown post, scroll down. 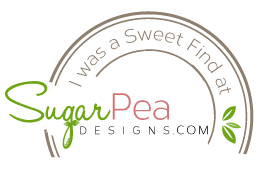 Welcome to Freshly Made Sketch Challenge day! Today, the wonderfully talented and expert-enabler Jen Mitchell is our hostess and she has an awesome sketch. I just received an order from Verve the other day, so decided to use some of my NBUS on my card. I stamped the coffee containers and colored them with Copics. For the band, I stamped onto some foil patterned paper and did some paper piecing. Whilst the center panel is perfect for patterned paper, I kept mine plain, just adding a sentiment from one of my new sets and a stacked die cut. I went over the die cut with my clear Wink of Stella pen. And that's it! Thanks for visiting. Be sure to check out how the rest of this amazing team have interpreted the sketch. Hi and welcome. 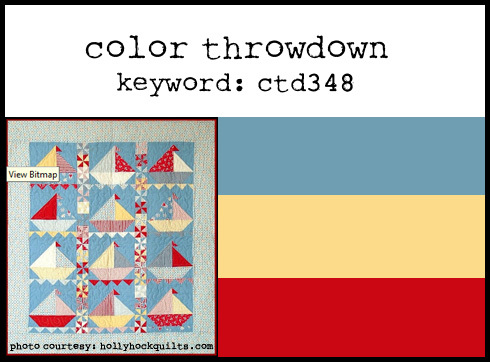 Today I have the privilege of being Guest Designer over at Color Throwdown. 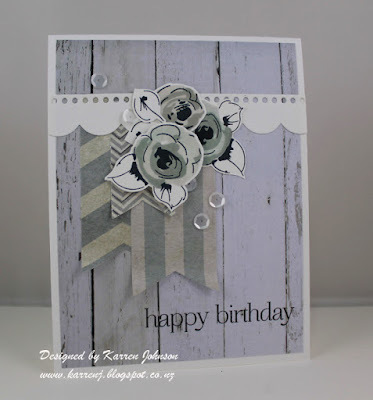 My card was chosen last week as Featured Stamper and that means an invite to be GD. No way was I going to say no to that! Aren't these such cool colors? 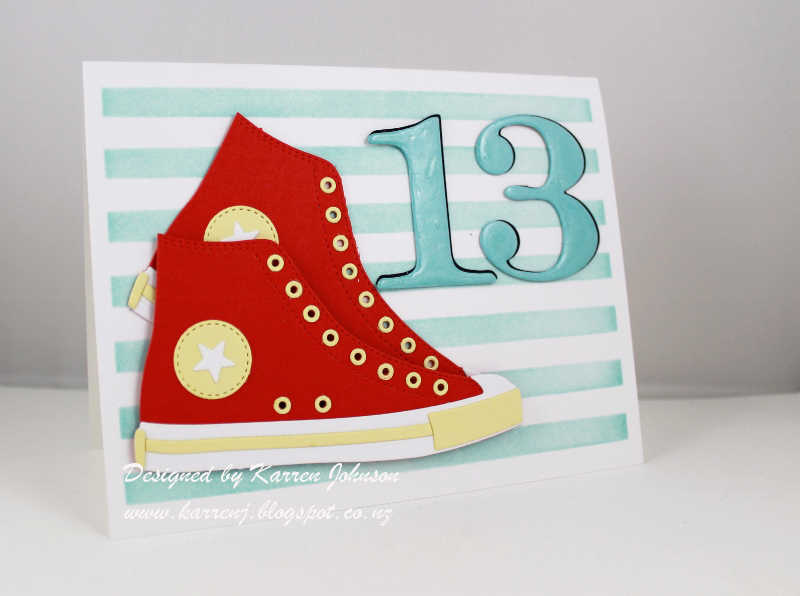 My mind immediately went to some NBUS I've had for a few months - the All-Star High Top die from MFT. 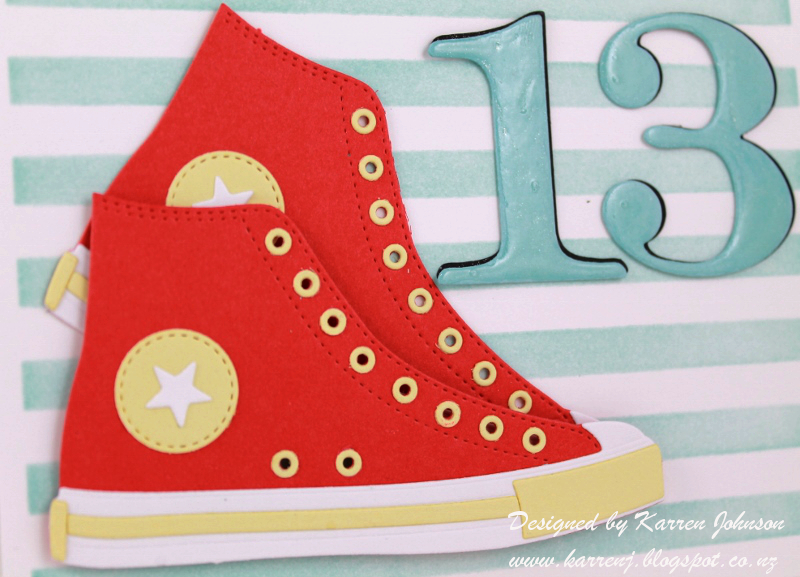 From there it was a short step to making a birthday card for my youngest son who turns 13 in a couple of weeks. My son tends to be a bit obsessive about certain things - Apple products and Converse shoes take top spots in his obsessions, so this die was a no-brainer for me. I started by cutting the shoes out of red, yellow and white cardstock then putting them together. Putting all the little yellow circles on was a bit of a painful exercise but I'm so pleased with the finished product. Thanks so much to the DT for letting me guest this week. 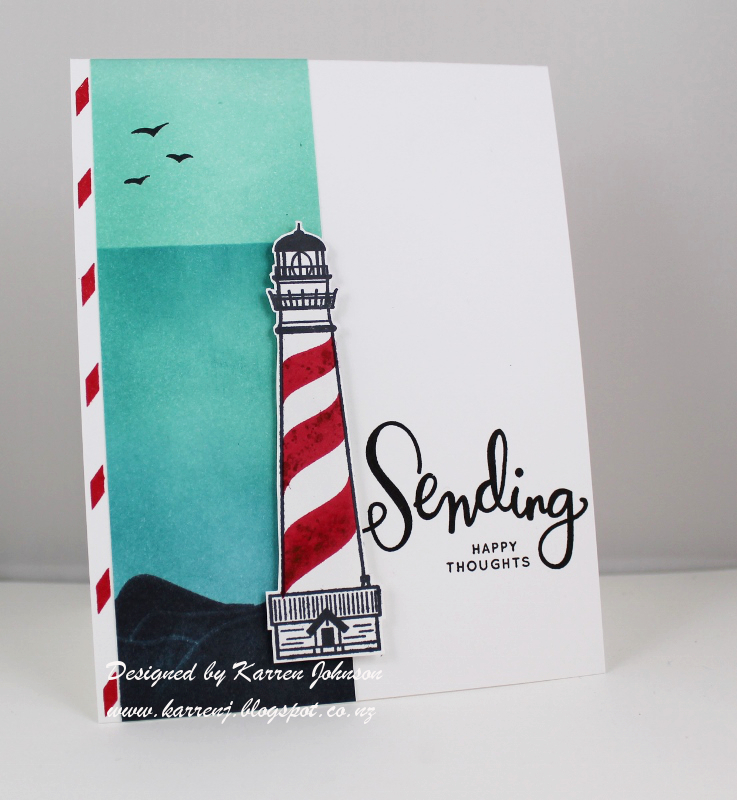 Be sure to check out their cards - every week they produce the most wonderful cards! 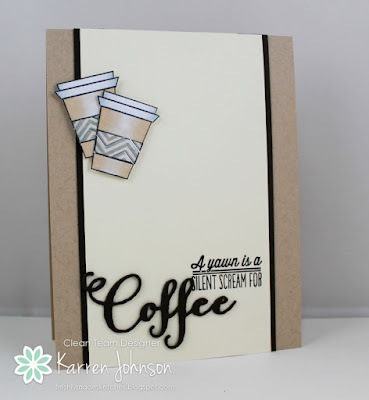 I'm also entering this into this week's challenge at Friday Mashup to add a stencil. 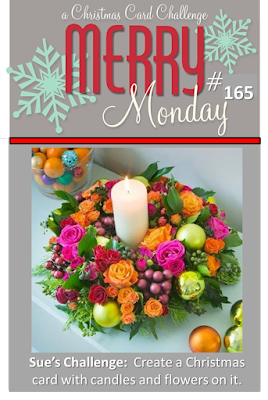 Welcome to Merry Monday's weekly challenge. 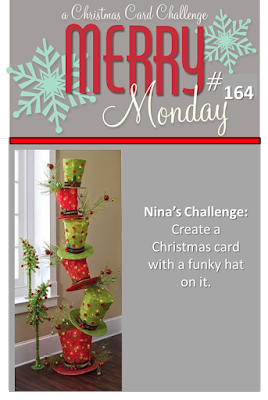 This week, Nina is our hostess and she has a very unique challenge for us - to create a Christmas card with a funky hat on it! Instead of stamping all three snowmen, I stamped one plus several of their hats. 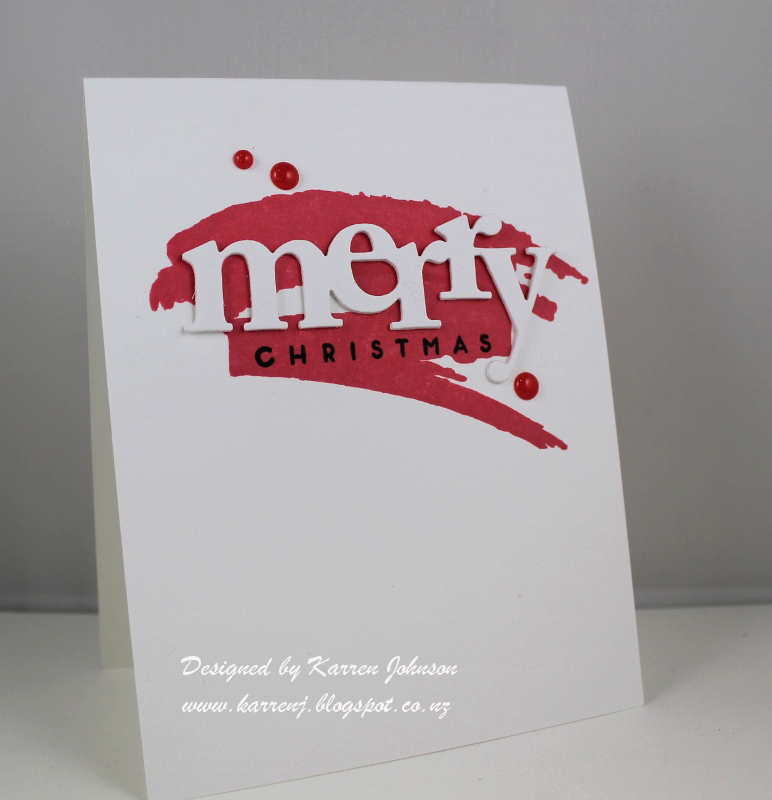 If you want to see what the stamp looks like before my cutting and re-arranging, then check out this card. I then cut out all the pieces and colored them with Copics. After carefully arranging the hats on top of the snowman I stuck it on to the card base with foam tape. The sentiment was deliberately kept very plain so as not to detract from the colorful snowman hats. Thanks for visiting. The rest of the design team have some very funky hats on their cards, so be sure to check them out. 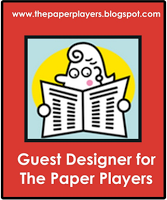 Hi and welcome to my Paper Players post. 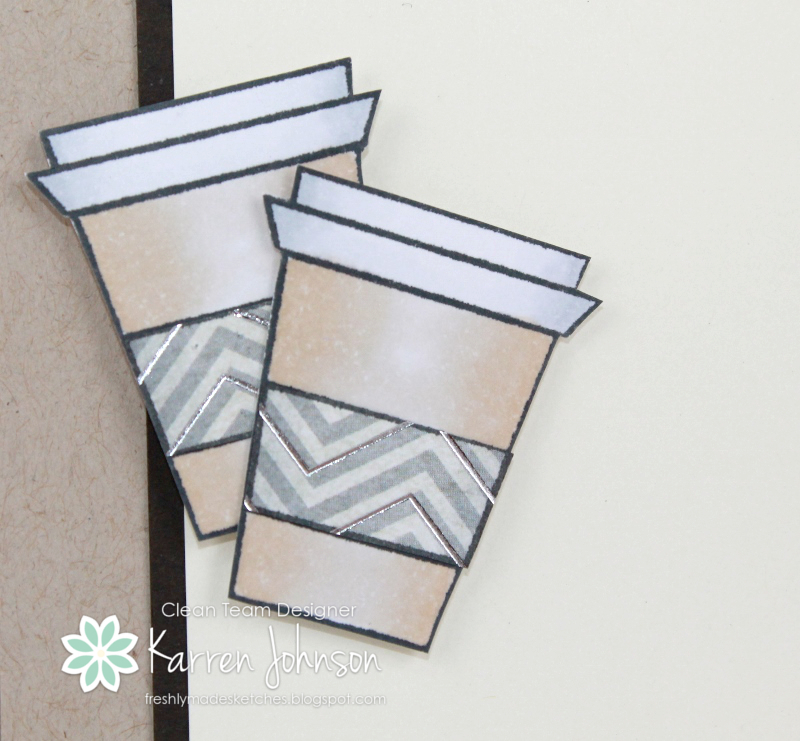 This week, Claire has a fun challenge for us - a CAS "Summer Treats" card. My card is a little bit similar to last week's DT card, but it wasn't intentional. It was just the idea that came into my head and nothing was going to make it budge. I used the sketch at CAS(E) This Sketch as well as the inspiration pic at Curtain Call for my card. I sponged a panel of white cardstock using some distress inks to produce a soft and subtle beach scene. Once I had finished sponging, I added some waves using my white gel pen, which you can see better in the close-up picture below. 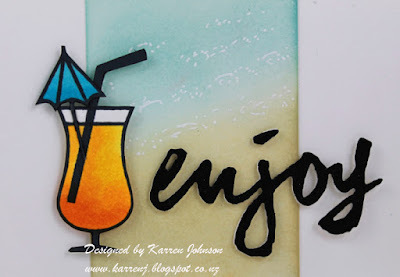 The drink was stamped then colored with Copics before being cut out. I die-cut the sentiment three times in white and once in black and stacked them all together. Both the drink and the sentiment are colored with a clear Wink of Stella pen. Thanks for visiting. I hope you'll have time to check out the inspiration from the rest of the design team. Edited to Add: This card won top honors at Curtain Call. Hi! It's Saturday afternoon here and I've had a fun and productive day in my craft room. 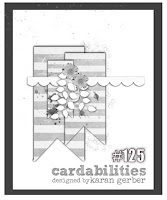 This card I'm about to show you uses the sketch from Cardabilities - a challenge I've never played along with before - and the neutrals theme at Seize the Birthday. This card was a real challenge for me! 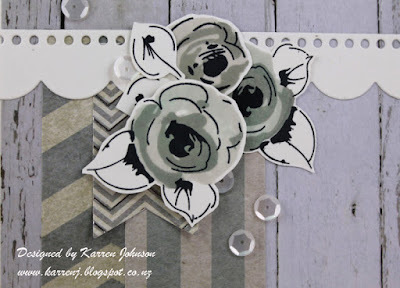 If you visit my blog regularly, you'll know I don't use patterned paper very often. This card not only has patterned paper, but four different patterns to boot! I cut the papers from a pack of paper I bought at the local department store. The flowers were stamped using Fog, Smoke and Memento Tuxedo Black inks before being cut out by hand. The scalloped edge comes from Blueprints 14 and the sentiment is from some NBUS I received yesterday from Papertrey Ink. The ends of the banners have been curled up slightly for some added interest. I love this sketch and I'm pretty sure I'll be using it again sometime. And, wouldn't you know it, I've only now just realised that the banners are meant to go above the scalloped panel. Doh! Sorry, Cardabilities team! Edited to Add: This card got a shout out at Seize the Birthday! 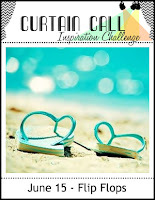 And we've rolled around to another wonderful Freshly Made Sketch Challenge! Love these sketches and love this team! 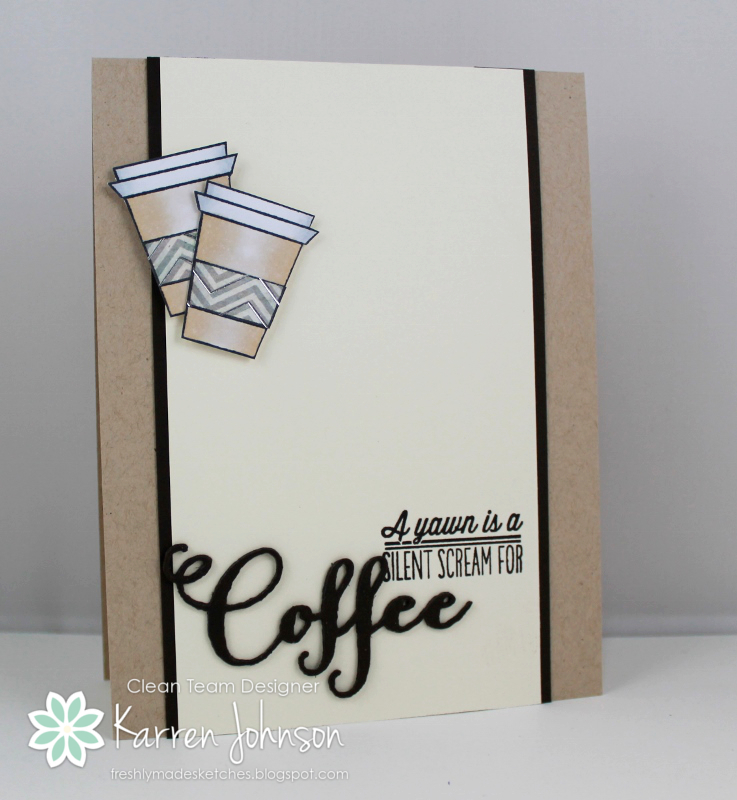 This week, Jennifer Timko, who makes such classy, CAS cards, has come up with a superb sketch. Look at the freedom this sketch allows for! 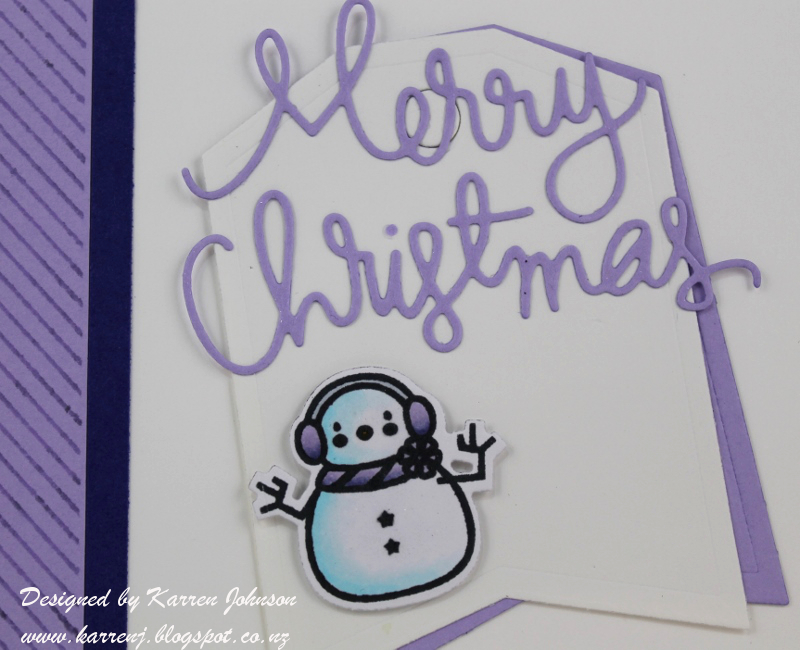 I did some Iron Off Embossing and lots of sponging on my card and I'm really happy with how it came out. 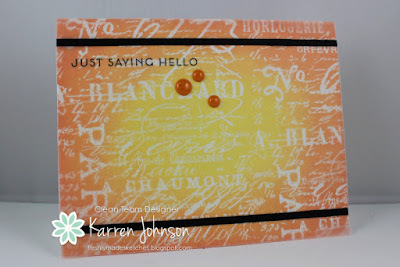 I clear embossed the script image from Tim Holtz' Papillon set onto some watercolor paper before sponging on various yellow and orange distress inks. I used watercolor paper because my original intention was to smoosh inks into my craft mat but I decided I wanted more control, so went with sponging. Once I was happy with the panel, I ironed off the clear embossing. I didn't want to cut the panel down to suit the sketch, so I interpreted the sketch slightly differently by adding strips of black cardstock to a piece of vellum paper. 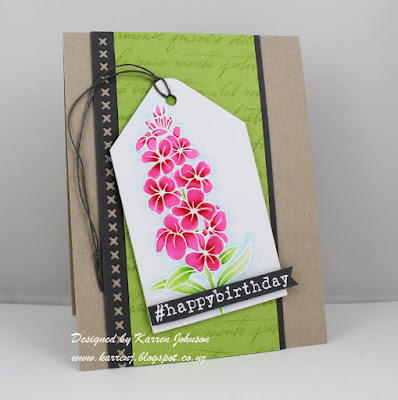 I then stamped the sentiment using Stazon ink. 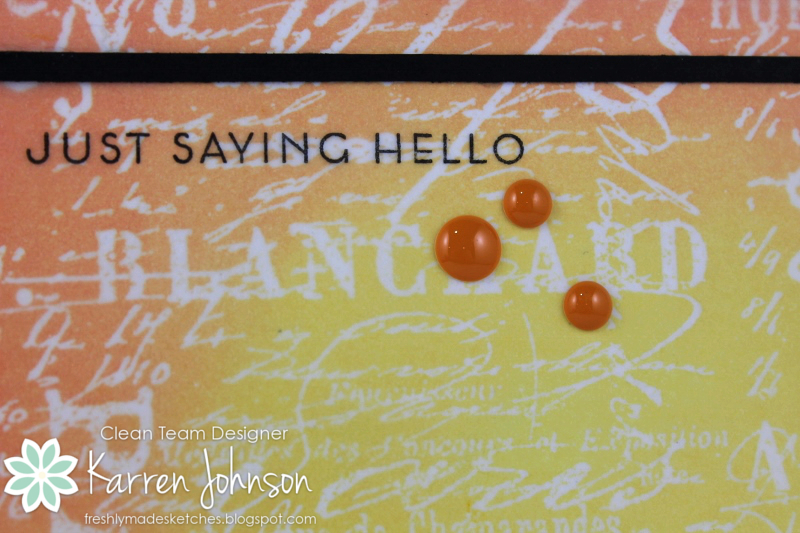 I placed some orange enamel dots on the vellum as a finishing touch. 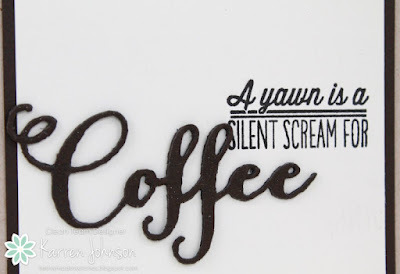 I am linking this to this week's Simon Says Stamp Wednesday challenge to use your favorite technique. I love everything to do with color - sponging is one of my favorites was to mix color. Thanks for visiting. The design team have some wonderful inspiration to tempt you to try this sketch, so please check them out. 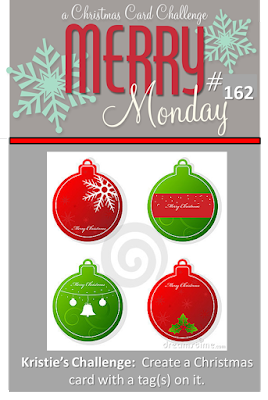 Welcome to another challenge from the team at Merry Monday! 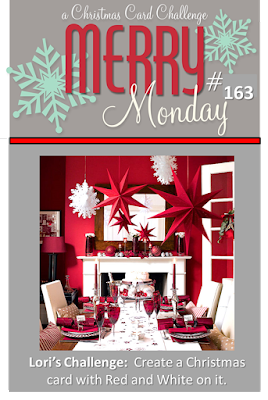 This week, Lori is challenging us to use red and white on our Christmas cards. 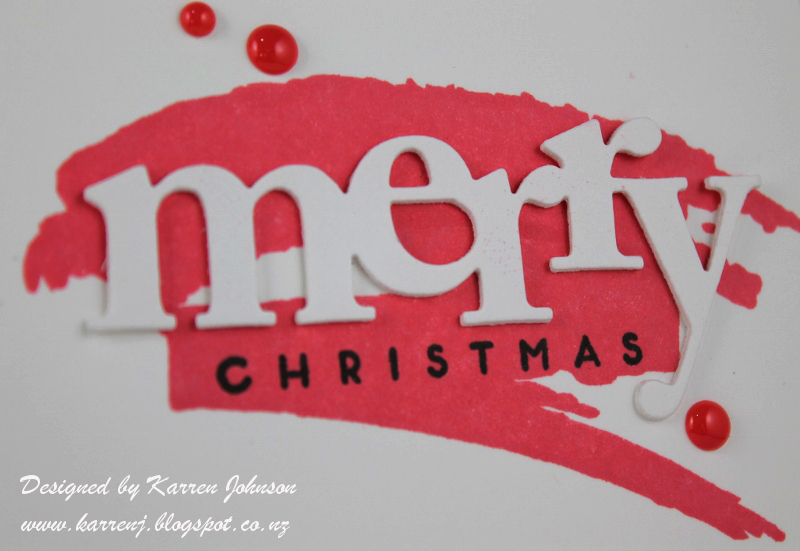 I had an idea in my head that I wanted a red watercolored background with large font "Merry Christmas" embossed in white. But, do you know what single color red watercoloring looks like? Try a crime scene photograph of blood splatter LOL. I had to re-work my plan so decided to tone it down a bit, pick a more pinky-red ink, some watercolor stamps, and came up with this card. 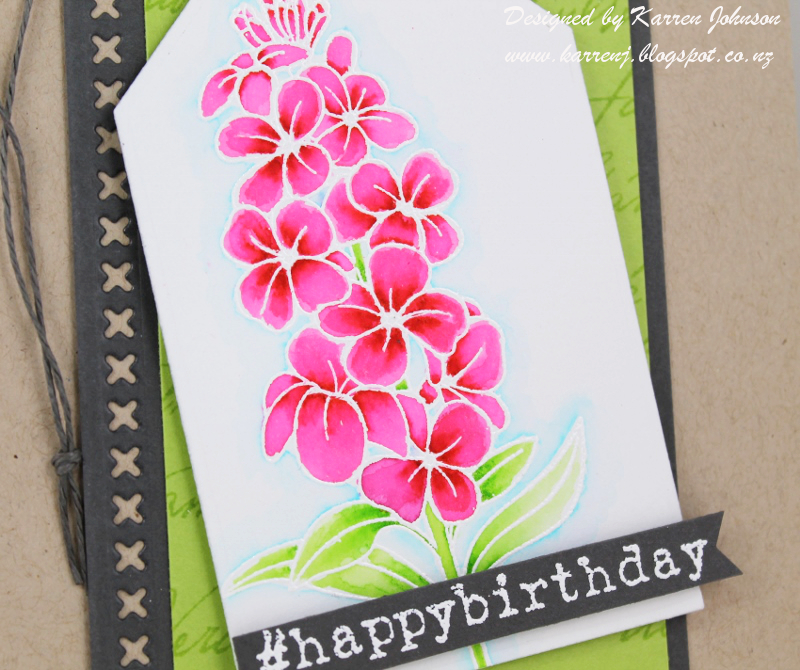 I stamped the paint images from Watercolor Wonder using Hot Lips ink from SSS. I then die-cut three of the merry die cut and stacked them together. The sentiment was stamped in black ink underneath. A few red enamel dots any my card was finished. Thanks for visiting. 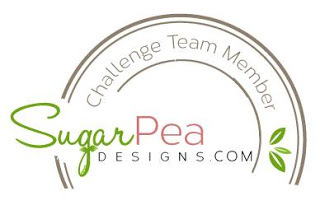 Be sure to check out the red and white creations from the rest of the design team. 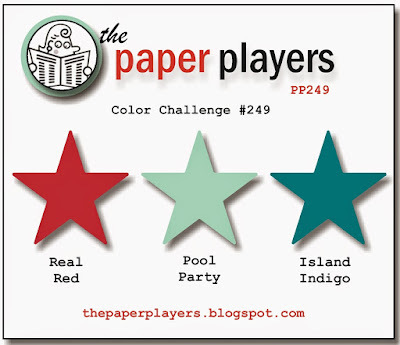 It's time for another Paper Players challenge and this week Sandy has a fun color challenge! As soon as I saw those colors, my mind immediately went to a nautical theme and there it stayed! 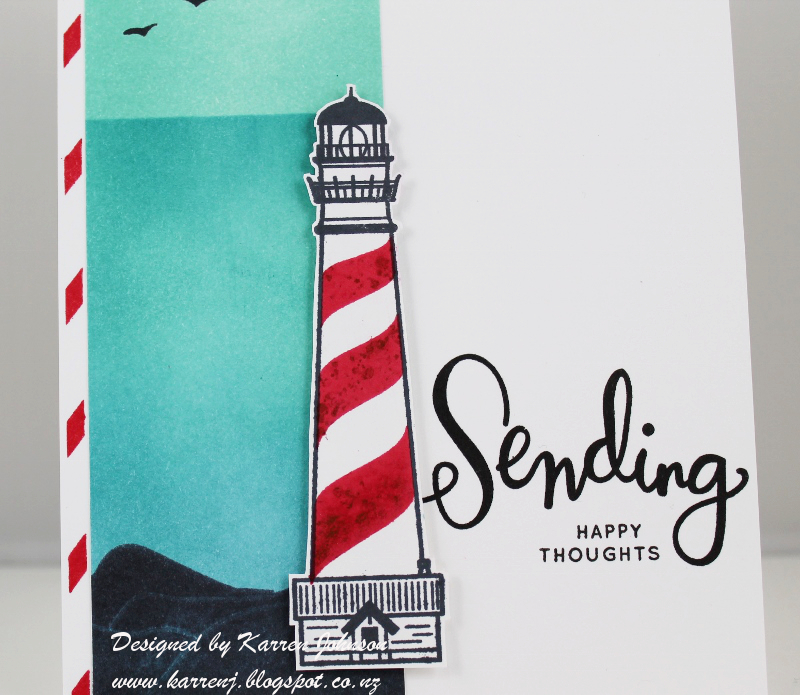 I started my card by stamping the lighthouse from Guiding Light and fussy cutting it out. For some reason my Real Red inkpad is looking a bit nasty and stamped all splotchy. I'm calling that the "weathered look" LOL. 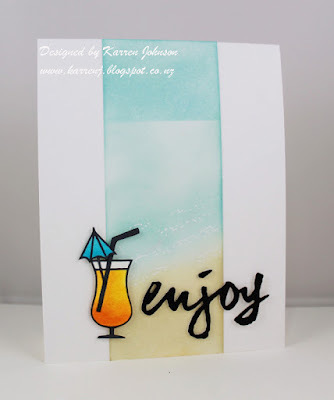 I then cut a strip of white cardstock and sponged it with Pool Party and Island Indigo ink. I placed a mask near the top to get the horizon line. I then stamped what I *think* are rocks at the bottom of the panel. I dug out my old Up, Up & Away set from SU to get the seagulls image. 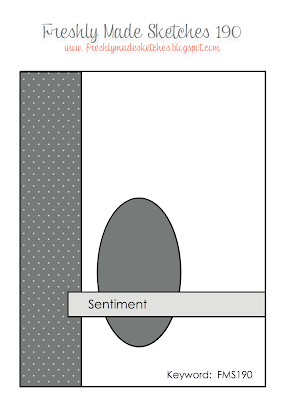 Then I went searching for a sentiment to fit in the gap. 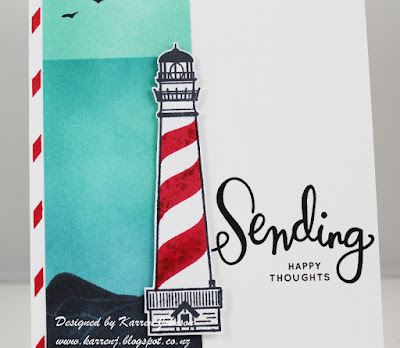 I found Sending Happy Thoughts and it also had the diagonal stripe stamp which went perfectly with the stripes on the lighthouse. Thanks for visiting. The design team have some wonderful cards using this color combo, so be sure to check them out. Hi, I'm back with another post today! 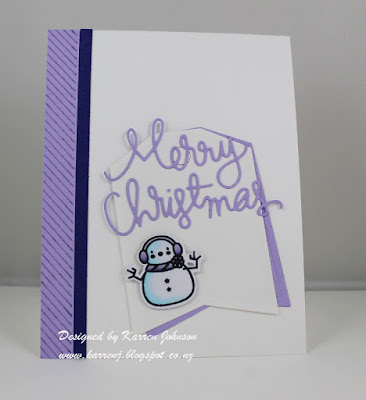 I've had some fun in my craft room today and churned out a couple of cards for challenges as well as my usual DT cards, which will feature during the week. 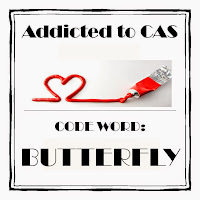 This card uses the inspiration pic from Card Concept and the butterflies code word at Addicted to CAS. 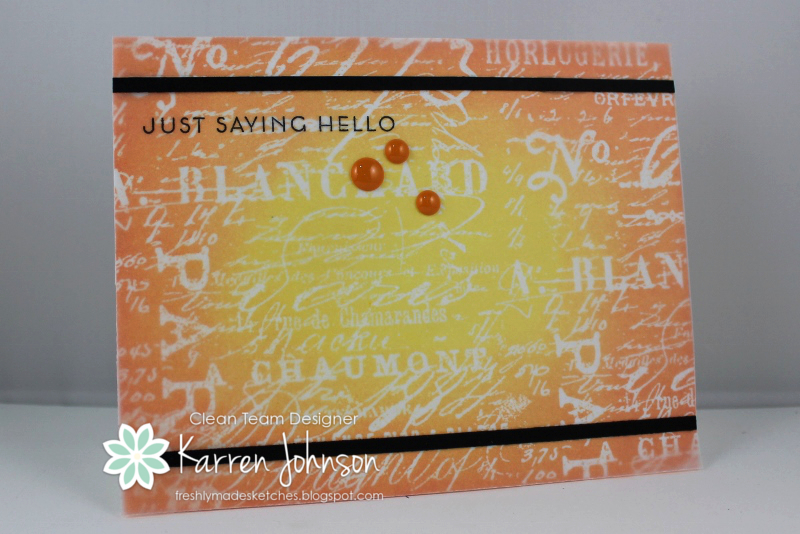 I started with a Fog card case, die-cut with a stitched rectangle die. 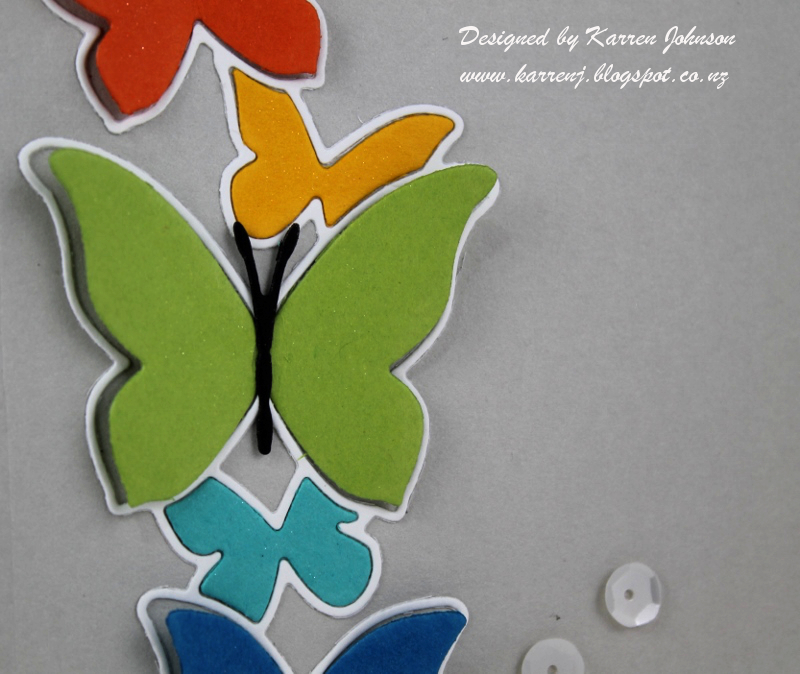 I then die-cut the Butterfly Drift die in white and rainbow colors. When I adhered the butterflies to the card base, the full butterflies were only stuck down in the middle so their wings can sit up. For the largest butterfly, I put a body and antenna on using the Leavenworth Trio die by Memory Box - a perfect fit! 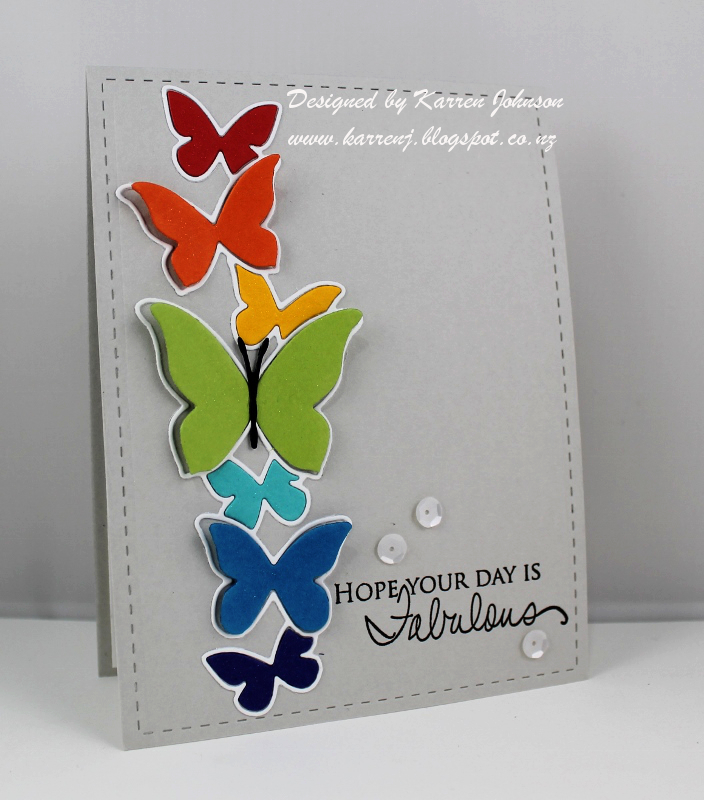 I wanted a scripty sentiment to mimic the butterflies' flight so used Signature Greetings by PTI. All the butterflies were colored with clear Wink of Stella for some shimmer. I'm still practicing with my Zig Clean Color Brush Pens and last night I watched a video fom Michelle Short which I found really helpful with my coloring. So I immediately went into my craft room and started coloring. This time I used a paintbrush rather than a water pen and it went so much better. Once I'd finished coloring, I left it overnight. This morning when I came back to it, I knew I wanted to use it with this sketch. Coincidentally the colors of hot pink and lime green were part of the line-up at Color Throwdown, so I immediately had the color scheme for my card! 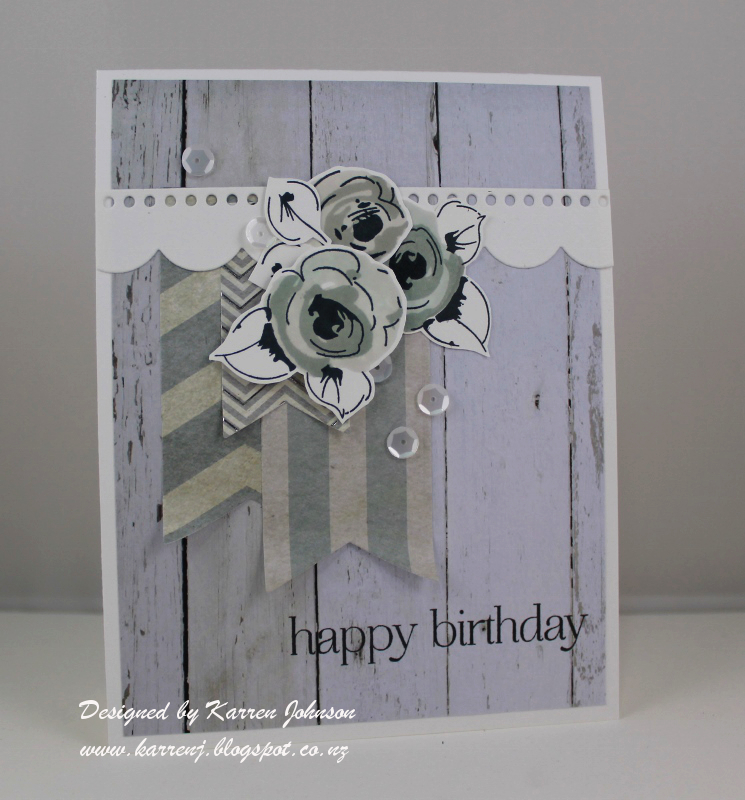 The card base is Neenah Desert Storm and the gray panel was die cut with the cross stitch pattern from Blueprints 20. The Green Apple panel was stamped with a very old Hero Arts script stamp. 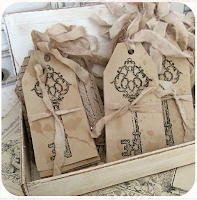 The sentiment comes from a NBUS set called #Hashtags by Tim Holtz. Both the sentiment and the tag are popped up on foam tape. Edited to Add: This card got the random pick at Color Throwdown. 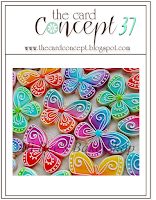 It's time for another fabulous sketch over at Freshly Made Sketches and this week the Queen of Color Combos, Amy O'Neill, is our hostess. Here's her sketch. 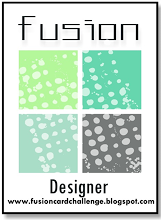 For my card, I wanted to use a lime green and white color combo so, along with the sketch, that was my starting point. From there, it was like pulling teeth to get a completed card! I won't go into how many versions and how much cardstock I wasted, but I finally got a card finished. The dots down the left hand side are white-embossed onto Lucky Limeade cardstock and the sentiment is also white-embossed onto black cardstock. Thanks for visiting. The rest of the design team have dished up some wonderful inspiration for you as usual so be sure to head over to the blog and check them out. Hi! 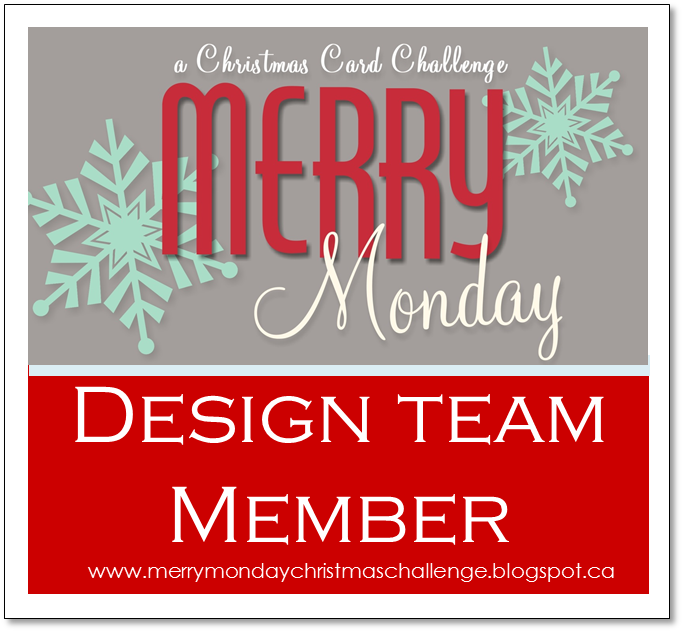 It's time for another Merry Monday challenge and this week, Kristie wants to see a tag on our Christmas cards. 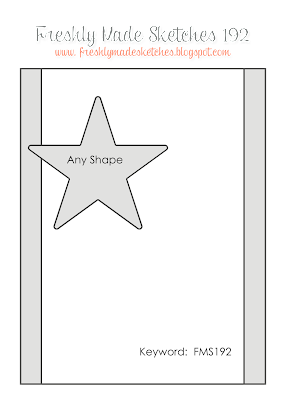 I went for a very simple, tried and true layout for my card as I was running out of time! 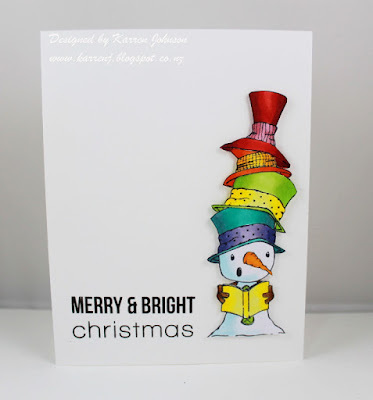 I stamped and colored the wee snowman from Polar Pals and cut him out with the matching die. I then die-cut the sentiment from some Lavender cardstock. The tag die is from Reverse Confetti and I cut two of those - stacking one behind the other. 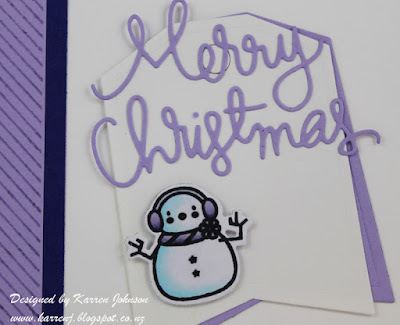 Down the left hand side, I adhered a panel of Lavender stamped with the diagonal lines stamp from Basic Borders and then a thin strip of Blue Violet cardstock. The sentiment and the snowman were both colored with Wink of Stella to give a nice shimmer to them. Thanks for visiting. 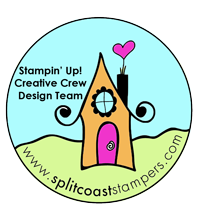 Be sure to check out the inspiration from the rest of the design team.